A disturbing phenomenon is occurring in Jerusalem, which should ring alarm bells in the minds of all who value democracy and freedom of religion as well as freedom from religion. An ugly trend is raising its head in Jerusalem - a city holy to the three monotheistic faiths: Judaism, Christianity and Islam. The sooner the cancer of intolerance is nipped in the bud the better. It is become fashionable in Jerusalem amongst various fanatic ultra..., who have been part of Jerusalem's community for centuries. The Christian and Muslim communities have every right to live in Jerusalem no less than the Jewish community. This awful phenomenon was aired on Israel Arutz 2 Channel this Frid....(I apologize that it is not in English but the clip will illustrate my point) It left me with a sense of disgust and shame! Apart from that, Price-Tag - a horrible mutant of the ultra-Orthodox Jewish Community of fanatics whose origins are in the hills of the Occupied West Bank, many of whom are descendents of religious illegal settler fanatics. The Israeli Government, which is representative of the fanatic settler movement and its entrails have not come out strongly enough in its condemnation of the hooliganism of Price-Tag and its Allies - the kippa-cladded, long ear-lock (payot), fringed (tzitzit) young hooligans, who carry out this thuggish behaviour against non-Jews in Jerusalem and the surrounding areas. They desecrate Christian Holy Sites as well as vandalizing their ce... All this seems to be done with the stamp of kashrut by their fanatic rabbis who teach them "Jewish values". This loutish behavior is nothing more than religious hooliganism of the worst kind. The reason - “we are doing to the goyim (non-Jews) what they have been doing to the Jews!” It is unacceptable and the perpetrators of these loutish deeds must be arrested and held accountable. Unfortunately, these deeds are overlooked by the police who seem to be caught off guard.These deeds are also overlooked by the Orthodox Establishment. The slogans of hate graffiti on the walls of churches and monasteries, as well as cars is on the increase. Signs of apathy by many Israelis only encourage this cancer to proliferate even further. Why have there been no arrests? This kind of behavior is no less contemptible than the desecration of synagogues and mosques. Hate of non-Jews is on the rise and, as a secular Israeli Jew, I hang my head in shame! Ultra- Orthodox intolerance for other faiths is not limited to that sect alone. Establishment Orthodoxy is hardly any less to blame. Their hegemony over the Jewish faith is absolute and this plays its part in every day life in Israel. The Chief Rabbinate of Israel is also no paragon of virtue. It has played its part to estrange many Jews from the fold including Yours Truly. Pluralism in Judaism is condemned by the ruling Orthodox Jewish Establishment. It has its tentacles in all the ruling governments since Israel's establishment. This includes zero tolerance and non-recognition of Reform (Progressive) and Conservative Judaism, which they see as a threat to their system of corruption, bribery and total monopoly on Halacha (Jewish Law). It makes me want to puke, and I am sure there are many Israelis who feel the same way - possibly the impotent silent majority. Non-orthodox Jewish rabbis cannot marry couples, who do not wish to be married by Orthodox Rabbis. The Orthodox Establishment also creates difficulties for Jews and non-Jews to marry. There is no civil marriage in Israel. If there is no civil marriage – only religious marriage then there is no religious freedom. Those Jews, who were converted to Judaism by Reform or Conservative rabbis, are not recognized as Jews by the ruling Orthodox Jewish Establishment and have to marry overseas in a civil marriage ceremony. Power corrupts and absolute power corrupts completely and this is true of the ruling Orthodox Jewish Establishment as embodied by its Chief Rabbinate that has deviated from Jewish values only to be replaced by corruption, bribery and “jobs for pals” in order to increase their power in religious Jewish matters pertaining to marriage, divorce, archaic Sabbath laws and burials where the disgusting practices reach their zenith. It is all money, money and more money as well as stakes that has nothing to do with Judaism. 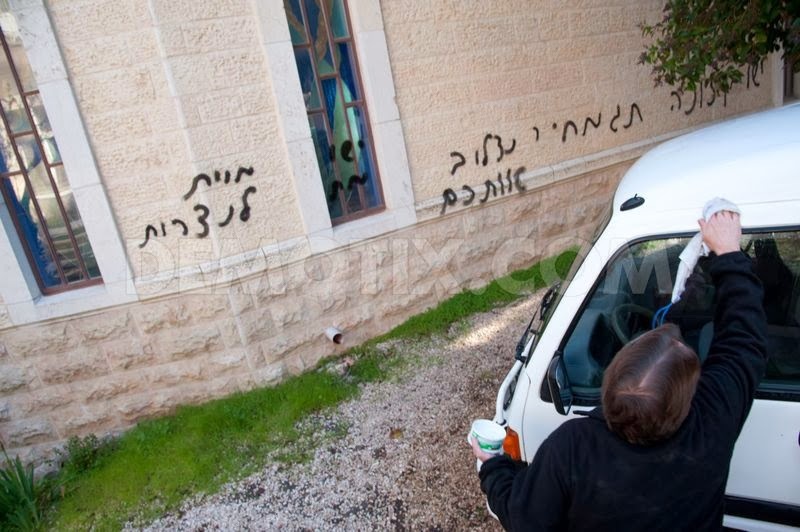 It is little wonder that groups like Price-Tag ( Tag Machir) and their fanatic, self- righteous allies are on the increase, spitting on Christian members of the clergy, vandalizing non-Jewish property, including cemeteries and getting away with it. If this would occur in Jewish cemeteries and synagogues, the heavy hand of the police would soon be felt. This hate of the non-Jew is on the rise in Jerusalem. It does not bode well for Israel's already battered world image. Is this freedom of religion when Price-Tag and their illegal settler-oriented supporters are given almost free reign on vandalizing Arab and non-Jewish property with impunity? Are we becoming a nation of self-righteous religious bigots with zero tolerance for those who are different? This is horrible .how can these people not see why this is wrong hate promotes hate .their brand of religion has controlled people's minds for centuries. The sad part is most Christians here in US still think their the chosen people an anything they do is God's plane. I am not sure if you have ever been to Israel before or just totally do not understand Israeli, Jewish society... The 'price tag' thugs are not ultra orthodox at all. While most of them are settlers they are a small group of thugs that are condemned almost across the board in Israel, The army just caught a few today before they could do their dangerous vandalism... Lets not compare this to the Palestinian terrorists who try and successful murder innocents, you sort of left hat part out. Also left out the part that these killers are not condemned by Palestinians but welcomed as heroes, kill a Jew and you get money and streets named after you. Moslems and Christians citizens in Jewish state of Israel have more rights than any Arabs in any islamic country - doesnt that tell you something? Jeff, I have been living and still live in Israel for nearly 40 years. My Hebrew is fluent and with all due respect, I am aware of what happens here. It is unfortunate that religious intolerance is on the rise and so is the return to religion. What I wrote is a symptom of growing xenophobia in Israel. No, what you wrote is fear mongering based on a few random case of violence, In no way is this connected to any conclusion you seem to make. There is no pattern here and I think you should take a step back and appreciate the freedoms the non-jews enjoy here and see as wrong as the price tag attacks are, they are just ahandful of attacks and not part of some new change. iJust read you comment an I understand what your saying. Murder is always wrong but try to understand If you came home from work an found your house destroyed an your children missing your mind might snap the same as theirs. There is two sides to ever story.every human life is important. Nelson Mandela If you want to make peace with your enemy, you have to work with your enemy. Then he becomes your partner. Nelson Mandela Only free men can negotiate; prisoners cannot enter into contracts. Your freedom and mine cannot be separated. Nelson Mandela There is no passion to be found playing small - in settling for a life that is less than the one you are capable of living. Nelson Mandela It always seems impossible until its done. Nelson Mandela There is no such thing as part freedom. There is no room in Israel, nor in any open, liberal democracy for religious intolerance. Unfortunately, we do see fringe elements in many societies making statements that do not reflect the sentiment of the greater society. In the case of hooliganism in Israel, regardless of the origination, we expect our government to be fair and swift in condemnation and rectification, as well as just and fair. And even with a good government in place, sometimes things do not work out because as we all know, the day to day activities of government are carried out by people.....and not all people are capable of doing a good and fair job. When government fails to protect the rights of ALL of its citizens in a just and fair manner, we should have a free press to point this out, and recourse to have the government failure be addressed.